When the new City Hall was built on Spui, the site of the old one was freed for housing designed in 1986 by the Spanish architect Ricardo Bofill but only realized since 1995. This all-neoclassical ensemble consists of a semicircular building containing 80 swish apartments (the Crescent), two eight-storey blocks (Athena and Acropolis), four oblong complexes of apartments (Megaron, Parthenon, Pergamon and Capitol) enfolding a triangular clearing, the Olympus residential tower with just one apartment per storey, the Gemini and Delphi apartment blocks terminating the ensemble, and five urban villas. 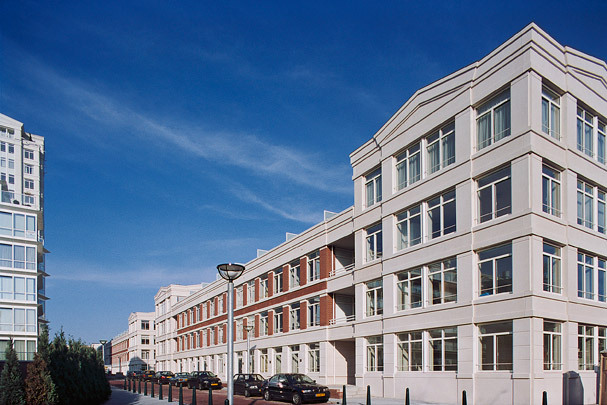 Classical forms such as pediments, piers and cornices are combined with brick and aluminium frames.